Did you see Liza Jane’s daughter as a darling kitten earlier this week? She went all out! 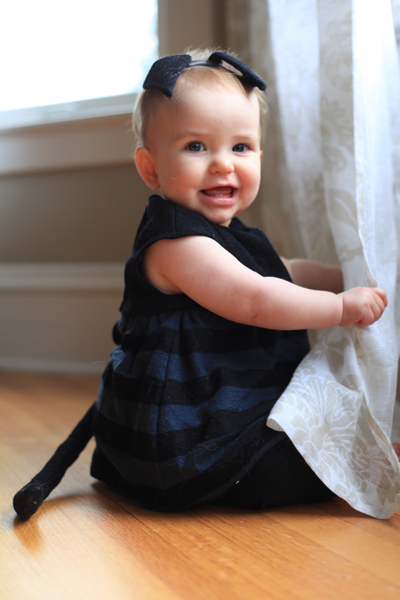 My little girl was also a kitten for Halloween this year, but in more of an abstract because-she-has-a-tail way. 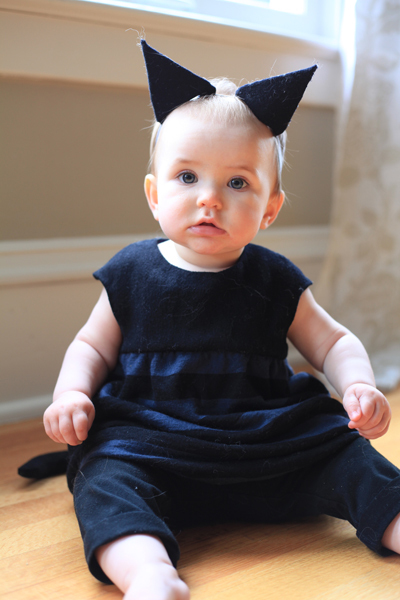 If you didn’t catch the post on MSN yesterday, here is my now nine-month-old daughter playing dress up for her first Halloween! Happy Halloween everyone! 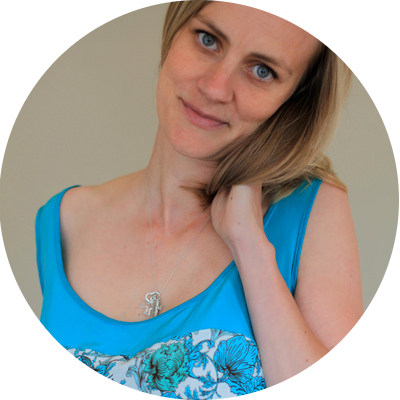 When I was prioritizing my sewing plans for this month (so many plans, so little time! ), I couldn’t pass up the opportunity to make baby girl a costume for her very first Halloween. She just loves cats, and I thought it would be pretty easy to make her a cat costume. Well, more like a kitten costume! First, I needed a little fabric. I chose Mood Fabric’s black wool crepe (first used in these pants) because of course she had to be a black cat. It is Halloween after all! Next, I needed a cute pattern. 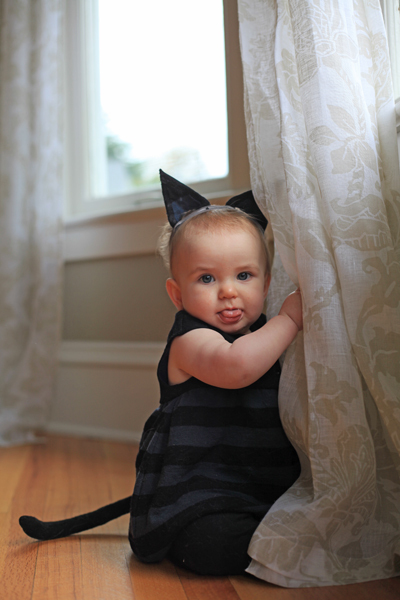 I dug through my stash and came up with the Oliver + S Bubble Dress (first made here). The bubble skirt just kills me every time. After that, all that was left was planning the extra cat details, like a crafty tail and ears. Ideally, she’d also have a little painted-on nose and whiskers, but I don’t trust her to keep face paint on for more than five seconds! 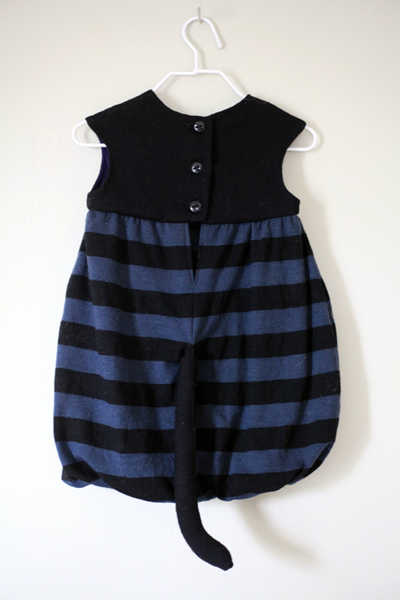 When I started to cut out the pieces from the wool crepe, I actually had second thoughts about making an all-black dress for a little girl. There was something a bit too morbid about it, even for this lover of all things Halloween. 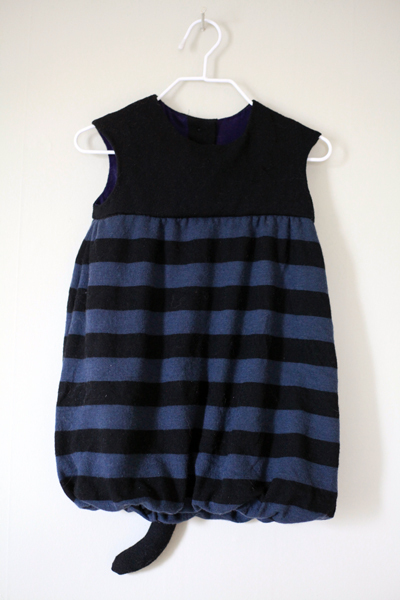 So, I decided to make the skirt from Mood’s black and gray striped wool jersey instead (first used in this swing dress and in this Drape Drape 2 top). Sad ears, but, hey, look! A tail! The skirt features some of my best stripe matching yet. Take a look at those stripes above! Also, it turns out wool + crawling on the floor + two cats + a house that’s not cleaned as often as it should be = an extra realistic cat costume covered in actual cat fur! Would you believe I rolled all the lint off this costume before putting it on her? 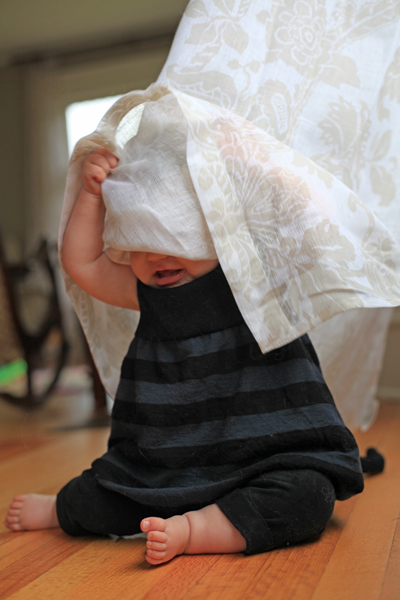 It doesn’t take long though for a little girl to find all the best dust bunnies, especially when playing peek-a-boo in the curtains! 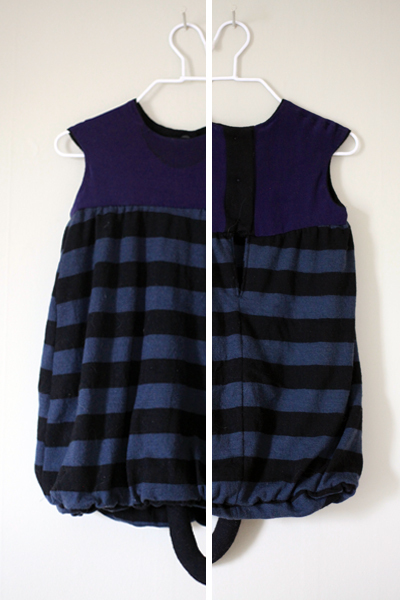 Following the pattern and instructions led to a garment with really neat insides. The lining of the bodice is machine sewn to the bodice in such a way as to enclose both the neckline and armholes, the lining of the skirt is machine sewn to the skirt in such a way as to form the bubble hem, and the lining of the bodice is then hand sewn to the skirt in such a way as to enclose the waist seam. The only downside is that you can only machine under stitch a few inches of the neckline the way the garment is constructed. I ended up hand under stitching around both the neckline and the armholes in order to keep the lining from peeking out. Next time I will cut the lining a wee bit smaller than the outer bodice to help keep it tucked inside better. Finally, I followed the instructions and topstitched the opening in the skirt below the button placket, but in hindsight it would have been just as easy to invisibly hand stitch it closed since I was already doing so much hand stitching on the inside. I hope baby girl enjoys her very first Halloween. We plan to walk in the neighborhood parade with her cousin, and then she’ll probably have to call it an early night – she is only nine-months old after all! And on a side note, have you seen those baby onesies that are actually a dust mop? We were tempted to get one for Jane when she was crawling. They really do a good job of getting up all the dust bunnies. Ha! No, I haven’t seen those baby onesies that dust mop! How funny! Hope Baby Jane enjoyed Halloween! Amy, this is too cute! 🙂 Great job adapting this dress pattern for the kitten costume. I’m sure your daughter was thrilled to dress up as her favorite animal for the day! I’m not sure what she thought of the ears, but she did like having a tail. It was soaked by the end of the day since it was the perfect length to chew on! that dress is adorable and so is your daughter. Thanks Beth! Wish we were closer so I could show her off to all of you! Thanks for sharing-she is adorable in her costume. Thanks! I do think she’s pretty cute, but I’m very biased! Adorable, Amy! Enjoy those little costumes! Thanks Shams! Like I said to Beth above, I wish we were closer so I could show her off to all of you! Obviously a fashion modelling career ahead of her, so chic! Hahahaha! We shall see what she becomes. With two scientist parents, it probably will be something creative in protest! Awww! That would have been too cute. It looks like she had a great first birthday party as well! Miss you guys! Thanks! Loved your Halloween costume as well, P Bubs! Thanks! Your cutie is growing up so much – it goes by so quickly, right?! It really does. And each new age is my favorite ☺️. Baby Girl is getting sooooooooooo big! She is a cutie…her costume is cute too. I’m sure you had fun on her first Halloween. Thanks! We had a great evening hanging out with family at the neighborhood Halloween parade. Then it was an early evening for her, as predicted. She likes her sleep! So cute! My one-and-a-half year old granddaughter was a baby tiger for Halloween, wearing a costume I made 17 years ago for our neighbor’s little girl, whose mom saved it all these years! So – save baby girl’s costume! These charming makes can have long lives, just like cats! Amy, baby girl is getting cuter by the minute! 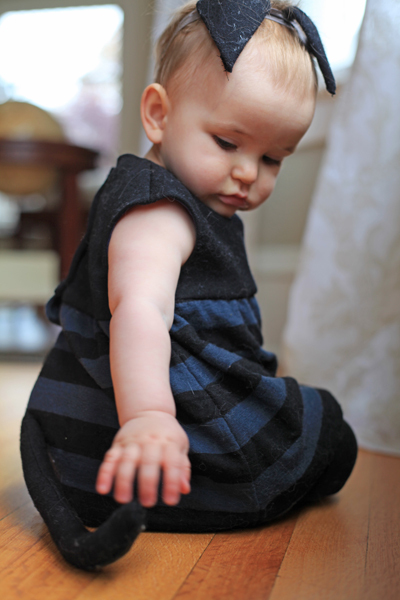 Isn’t sewing for little ones awesome? It is. Such tiny pieces. Such easy fitting. And such cute finishes makes! Aaaaarg my ovaries! That’s one cutie patootie baby / costume. This is so sweet! Your baby is so, so cute!! !